The Time Stamp is encoded on both the electrophysiological data and the start of each video frame immediately after the point of acquisition. 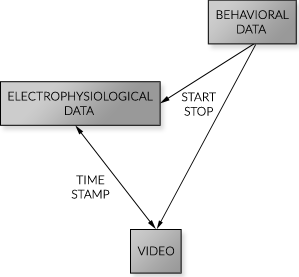 Data and video are now time-linked together at the source as the behavioral experiment master computer provides the start and stop signals. 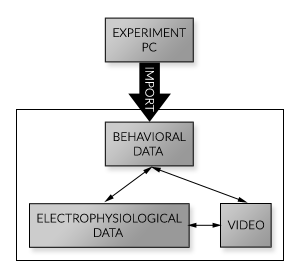 During analysis, the behavioral data is imported and synchronized with the electrophysiological data/video timeline. 4 Channel Video Capture card for use with CI.4600V-U-3 Series Video Integration Module. Video acquisition (.AVI format) with START and STOP facility and quad output. Requires CI.4600V-U-1 Capture Card and EITHER CI.4600T-U-1 for tethered systems OR a CI.4600V-U-3 Series Integration Module for wireless systems. 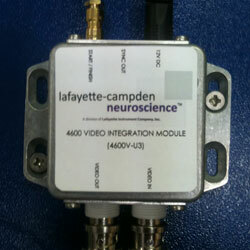 This Video Integration Module provides a timestamp at the point of acquisition with electrophysiology data. One unit per chamber required with wireless electrophysiology system. For use with MCS Experimenter. This Video Integration Module provides a timestamp at the point of acquisition with electrophysiology data. One unit per chamber required with wireless electrophysiology system. For use with Timestamp Video (3rd Party). Connection cable for Model CI.4600V-U-3-1 Video Integration Module to MC.4600W-U-1. Connection cable for Model CI.4600V-U-3-1 Video Integration Module to an external trigger.